Plugins to provide extra processing capabilities e.g. capturing data reporting or user notification. Audit Trail plugins are triggered after a process-related event. Plugins to integrate users from external systems e.g. Active Directory or LDAP. Plugins to extend methods of executing an action on list item e.g. deleting a record. Plugins to extend methods of loading data for a list. Plugins to extend ways of formatting column data. format cell data with some HTML styles or actual data from a foreign key. Plugins to extend ways of filtering a list. Plugins provide the ability to recalculate deadline and SLA limits based on custom logic. Calculate deadline based on office working hour. Plugins to extend types of fields available in the Form Builder. Plugins to extend methods for loading form data from any data source. Plugins to extend methods for loading form field options. Options Binder to retrieve options from another form data. Options Binder to retrieve departments. Options Binder to retrieve grades. Options Binder to retrieve groups. Options Binder to retrieve organizations. Options Binder to retrieve users. Plugins to extend methods for storing data in a form to any data source. Plugins to extend ways to validate form data. Plugins to extend support for processing hash variables. Plugins to provide custom mapping of users to workflow participants. 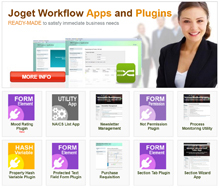 Plugins to integrate with external systems or for additional form processing. Plugins to extend types of pages available in the Userview Builder. Userview Permission Plugins to handle permissions and access rights in a userview. Form Permission Plugins to handle form-level and section-level permissions and access rights. Userview Theme Plugins to change the UI design of userview.